CARBONDALE, Ill. – Students in Southern Illinois University Carbondale’s automotive technology program will be busy once again at this week’s General Tire Street Machine Nationals in Du Quoin. This is the fifth year students will have developed, judged and presented the “Best Integration and Use of Technology Award” since the event returned to Southern Illinois in 2013. Each year, students design and fabricate the one-of-a-kind trophy. They assemble a judging team, develop a plan and put into action their processes to evaluate thousands of show vehicles over one weekend. Students will look at the more than 2,800 high performance street machines, hot rods and trucks expected in Southern Illinois Friday through Sunday, June 23-25. The trophy is a V-6 exhaust manifold with various timing gears designed by automotive technology students. The interaction between students, car enthusiasts and professionals is important, according to Michael Behrmann, department chair. Students receive advice from professional judges prior to canvassing the event. Behrmann anticipates that about 20 students, including some who are returning to campus from summer internships, along with faculty and staff, will be involved. Another important component is the students’ ability to engage with different vendors and company representatives who also will be at the event, Behrmann said. 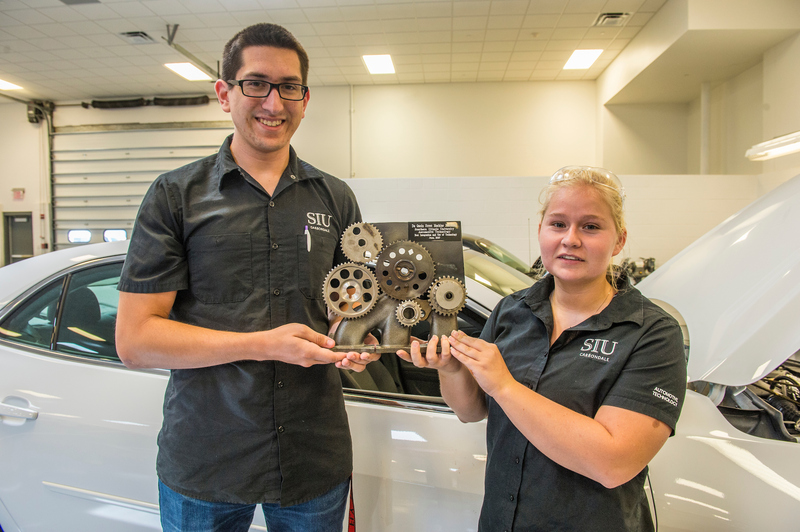 For a second year, SIU students will host a “Hot Rod Hospital,” where they lend a hand in making repairs or loan tools and equipment to event participants who need to make quick adjustments to their vehicles. Last year, this lead to important community engagement as students assisted several participants whose vehicles had breakdowns while on the grounds. In addition, students will once again show off their 1966 Chevy Nova Super Sport, a project that started in 1985 with a $100 body. Students receive first-hand knowledge while working on the drag car, which competes locally in Benton, Paducah, Ky., and Sikeston, Mo. Last year, the car was the foot brake class track champion in Sikeston, Behrmann said. The event is not just for muscle car and truck enthusiasts, but also for those interested in detail involved in fabrication and metalworking, Behrmann said.